The 'Academy Awards' of Entrepreneurship celebrated its second Induction Event for the Class of 2013 into the Entrepreneurship Hall of Fame at the Carter Center In Atlanta. The Entrepreneurship Hall of Fame class of 2013 induction event was held Saturday, November 16, at the Carter Center at 7 PM. The event was sold out, with more than 337 attendees. · Kay Koplovitz, founder of the USA Network, the first woman network president in television history, chairman of Koplovitz & Company and co-founder of Springboard Enterprises. · Donald Panoz, co-founder of Milan Pharmaceuticals (Mylan Laboratories) the inventors of the transdermal patch, Shop & Save and Bioneering. Panoz founded Elan Pharmaceutical and Fountainhead Development, builder of luxury resorts, including Chateau Elan Winery & Resort in Georgia. Entrepreneurship Hall of Fame awards were also presented to John Hope Bryant (Social Entrepreneur), Xernona Clayton (Humanitarian Award), Jerry Darnell (Philanthropic Award) and Mary Kennedy Thompson (Veteran Award). Mitchell Schlimer, Founder and Executive Director of the EpiCenter, home of the Entrepreneurship Hall of Fame, called the event "a celebration of entrepreneurship, that "illuminated the past, empowered the present and inspired the future for entrepreneurs of all ages." 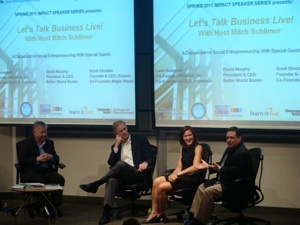 Mitch attributes the event's sell-out status to "the support and sponsorship of AdviCoach, The Entrepreneurs Source, Excent, Georgia Pacific, SBC, Service Brands International, Arke Systems, Aaron's and Young Entrepreneurs Georgia." Recognized last year by The Huffington Post as "the Academy Awards of Entrepreneurship," this year's event included special performances by Broadway star Sandra Joseph, the longest running Christine in Phantom of the Opera, and Atlanta's 20 year old singing sensation Jordan Humphrey. One Talent Inc. brought the house down when they performed their new song "Believe in Yourself." Award winning journalist and media personality Nicole Watson, and book author and media production company entrepreneur Glenn Carver, served as co-hosts of the event. 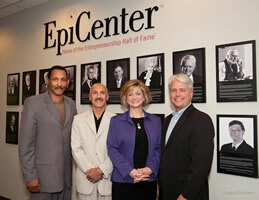 The EpiCenter, Home of the Entrepreneurship Hall of Fame, is located at 245 Peachtree Center Avenue in downtown Atlanta. For additional information, www.epicenterinternational.com and www.theehalloffame.com. 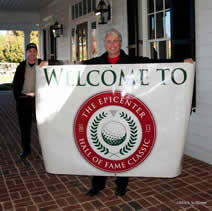 Read the Huffington Post Article on the Inaugural Induction event at the Estate on December 1, 2013. 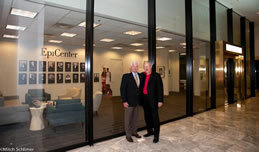 The EPICenter (home of the Entrepreneurship Hall of Fame) opened its brand new headquarters in downtown Atlanta on October 1, 2012, which is located at 245 Peachtree Center Ave, Suite 275. On November 14, the Entrepreneurship Hall of Fame which is located within the EpiCenter in downtown Atlanta, held its first EpiCenter Hall of Fame Golf Classic at TPC Sugarloaf. It turned out to be a beautiful crisp fall day and everyone had a wonderful time along with some wonderful networking, golf and 19th hole party for all. There was even two contests, of which one was a putting contest for $10, 000 and the other for a whole in one to win $1,000, 000. Mike McDowell from 58 Advertising almost won the $10, 000. Here are some of the photos which was a real "classic" for everyone involved. View a selection of photos from the event.